Our weddings are full of ceremonies and last well over two days, whittled down from the five day-ceremonies of yore. But celebrations begin much earlier and social get-togethers follow. Friends and relatives are invited days ahead and expected to participate in all events. For those who can’t, there are photographs and videos! 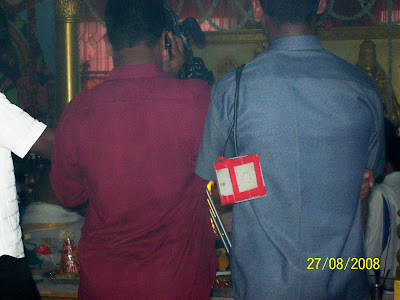 Videographers and their assistants – sometimes more than two pairs – stand in front of the dais where the marriage is being conducted, and manage to block everyone’s view of the proceedings. True, they have their job to do, and do it properly. But for those wanting to see the ceremonies live, and not a recorded version, it is frustrating. I saw people going up to the side of the dais to see the ceremonies. And because of this ‘blockage’, close circuit TVs and screens on both sides of the hall (in one instance, even in the dining section) display the ceremonies ‘live’! Which brings me to my gripe. Are videos really necessary? They are hours long, and I have not met anyone who is really enthused over seeing them. There are bound to be interruptions too. No one has the patience or time to sit through hours of these videos, unless it is to check out the few frames they are in - “Can we fast forward the next bit?” Most of the video players are defunct now, and the videos have to be converted to CDs. You need DVD players, and even in the remote possibility that someone actually wants to see the wedding ceremonies, you need to have power, and some nimble young fingers to operate the remote. I have to confess I haven’t viewed the wedding videos of my sons more than a couple of times, but the photograph albums are almost worn out. I suggest that the videography be done away with. Instead let there be more photographs, as many as you like, in black and white (they are really far more glamorous), in colour, in sepia, whatever. Let there be many albums – one for each ceremony, a picture to a page. The albums can be held conveniently and one can look at the pictures peacefully, at one’s own pace. Convenient breaks can be taken, without having to hunt through frames for the last one seen. I took a quick poll among those present, and was happy to find that everyone I asked was in agreement. When so much is being spent on weddings, the budget allotted to the videography may not be much, and scrapping it may not be a big saving, so that is not my concern. It is just that it is an exercise in futility. 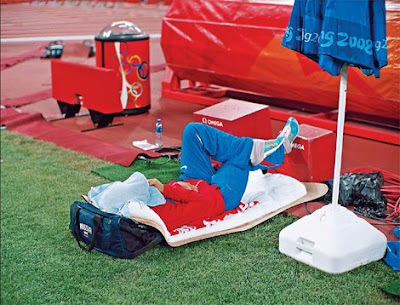 In the center of the 91,000-seater Bird's Nest, in the midst of Olympic competition and competitors all around her, in the middle of the pole vault final, it showed her taking a catnap, face covered, seemingly switched off from the rest of the world. This year my birthday seems to be a long-drawn out affair! I am still getting wished, and a friend from our music group gave me a lovely gift a couple of days ago. 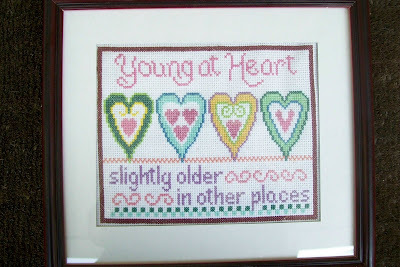 It is a beautifully framed sampler, done in cross stitch. As soon as I saw it, I burst out laughing. So will you - see for yourself. And here I have been, thinking that needlework (all kinds) is an outmoded occupation, with everything being done by professionals – sewing, smocking, embroidery - manual and machine. Women are so busy working and running their homes, caring for the children and looking after the older ones at home, where would they find the time to indulge in a little embroidery or knitting, I wonder. 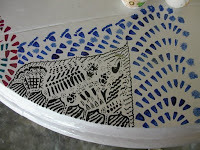 But Vatsala had done this in her spare time, and she is a busy person too. I have seen her gifts to other members of our group and admired her artistry. Any kind of sewing needs immense patience and concentration, not to mention good eyesight. My own acquaintance with needlework is limited to pedestrian and necessary sewing. My mother, however, is a dab hand with knitting needles and wool and has turned out stuff which are fashion statements, like the ponchos and cardigans which the younger ones in our family display proudly. The too young to know other models like babies have grown wearing layettes fashioned by her. In her younger days, my mother despite lacking the mod cons of today in running the home –no mixie, no grinder, no fridge - and taking care of her family (children and in-laws) , used to embroider tablecloths and doilies using small beads. Sadly none of them remain now. And she was an expert with the crochet needle, too. 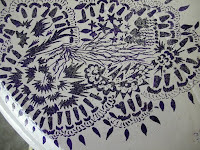 It is amazing how yards of materials can be created out of one needle and a skein of thread. I have not seen anyone do any crochet in a long time. Today’s youngsters are more at home on keyboards than needles and thread. A young member of the family who is deft with the needle is my niece Swati. In a day where there is so little time for youngsters to indulge in what their fancies choose, what with the pressures of studies and exams, it is heartening that they do not stifle their creative instincts. These crafts will certainly live on in their artistic hands. ‘Kangalirandal, un kangalirandal’ - this is the song that is haunting me day and night now. And I can say it unabashedly. It is played daily on Vividh Bharati (the old faithful), and on all the Thamizh channels showing songs from new movies. After a long time, a song the lyrics of which are, should I say, clean enough to be sung loudly without causing any embarrassment to the singer. I have loved film music, both Thamizh and Hindi from the days of G. Ramanathan and Naushad. It was the melody that caught the imagination then, words had to be learnt, (singing even ‘kaadal’ or ‘pyaar’ in those days was frowned down upon!) and the ultimate pleasure was seeing the song in the movie. And of course, it was not always possible to see all that caught your fancy. TV today has filled that void now with its telecast of old songs. The music has always been the first thing to attract one to a song – right through Shankar Jaikishan, R. D. Burman, and here in the South, through Viswanathan Ramamurthy and Ilayaraja. And then A. R. Rahman, and a host of others – all very creative. From the 1980s there was this phenomenon of the words being drowned out by the instruments – now that isn’t always a bad thing, I feel, considering the words of today’s songs. What respectable 60 plus grandma can sing beautiful melodies however sweet they are when the lyrics border on the obscene. Is this what Keats meant when he wrote, “Heard melodies are sweet, those unheard are sweeter”? Now here is this song from Subramaniapuram,which is set in the 1980s, in a Carnatic raga with a lilting rhythm by James Vasanthan, romantic words by lyricist Thamarai (she also wrote ‘vaseegara’) and singers Belly Raj and Deepa Mariam (new, I think). The melody is rather like the Ilayaraja number ‘Chinna Kannan azhaikkiran’, possibly because they are both in the raagam Rithi Gowla. The picturisation is pleasing, creating a romantic scenario in which the hero’s endearing smile (despite the bushy beard), and the heroine’s expressive eyes are bonuses. Please click on the picture to get the maximum effect. August 19. It is the third day of the Madras Week, a week of celebration, to mark the founding of this wonderful (it really was once!) city. What started out as Madras Day, August 22, has now five years later, become Madras Week. The concept of marking this event was put together by a group of writers and heritage lovers like S. Muthiah, Vincent D’Souza and Sashi Nair. And celebrating the city at various venues and in different ways (heritage walks, talks, cultural exhibits, reading sessions are only some of the activities, culminating in the most popular Madras Quiz) has become the mode of expressing one’s love for the city. At C. P. Art Centre today, two different, yet associated events took place – one was the release of the book “The Early History of the Madras Region’ by Dr. K. V. Raman, and the other was the inauguration of an exhibition of V. Narayan Swamy’s private collection of Early Portraits of Madras – Etchings, Engravings and Aquatints. 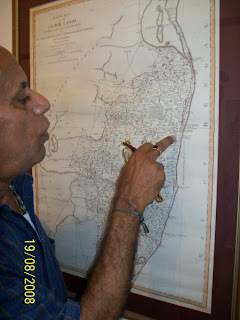 Both events were clubbed and released/inaugurated as one by the custodian of Madras Heritage – S. Muthiah. In his speech he decried the disappearance of social studies from school syllabi, so essential to the forming mind to learn appreciation of heritage. He also regretted the mindless demolition of heritage buildings. He pointed out to the beautiful hall the meeting was being held in – part of the magnificent house of C. P. Ramaswami - and wondered what might happen to it, were it not for Nanditha Krishna, Hony Director of C. P. Ramaswami Aiyar Foundation. I will need a separate post to describe that place. I have yet to read the book, but am told it is of great interest to historians and history lovers, remarking on a period long before the British came to Madras. Raman was professor of Ancient History and Archaeology at the University of Madras. The book is actually a republication of what was first published in 1959. 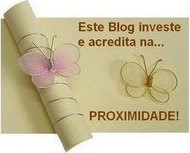 More details on Sashi Nair’s blog. 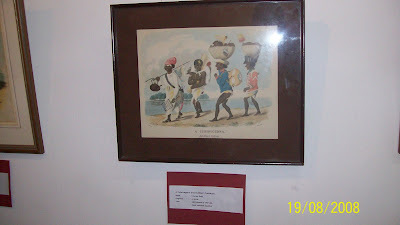 Of greater interest to me was the exhibition of the prints, mainly because Narayan Swami, who is part of our wide family circle, had mentioned that they would be on display to coincide with the Madras Week. The prints and etchings are really fantastic – and they have been preserved with so much care and affection. His wife who was present (he was not on account of another engagement) told me that it was a collection made over more than 25 years – and only part of it was exhibited. I am thinking of a time that was when the road to St. Thomas Mount(which is why it is called Mount Road) from what was once the Governor’s residence (behind what is now called Rajaji Hall - then the Banquet Hall)) being just unpaved road down which horse drawn carriages would roll. 2.A map of the Jahgir lands of the East India Company as at 1794. 3. 'View of Madras' in the 1820s, artist unknown. 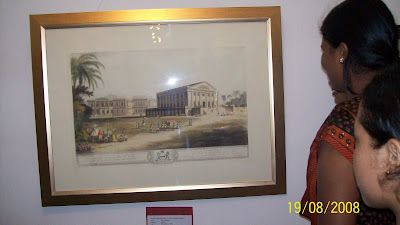 4.Government House and Banqueting Hall, by architect John Goldingham circa 1800. Yesterday was my birthday. Another one, sigh! More grey hairs, more wrinkles and more creaking joints. I was not sure I was looking forward to it. The day however, began with a lovely surprise. My mother had arranged for a bunch of flowers to be delivered first thing in the morning. She had quietly sent a note via our helper to the florists next door with the request! 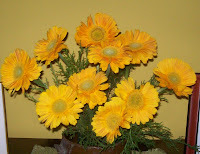 A bunch of golden yellow gerberas – grown by tissue culture. 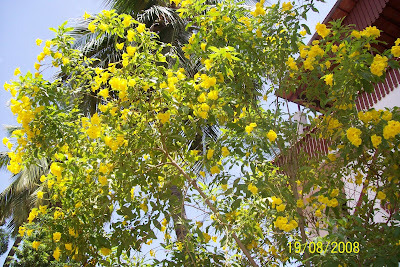 As the day progressed, family and friends, including my teacher from our Pondicherry days, called to wish me, and the morning whizzed by with e-cards and e mails with wishes. It did feel nice to be remembered and a warm feeling enveloped me. The first call was from Sriram. We got round to discussing the last birthday when we were with him, and the one before that here in Chennai, for which he had arranged an elaborate get-together of family(including one brother, one sister, and the other’s family) and close friends. A 60th birthday I suppose, justified the celebration. The surprise was when Sankar, Jaisri and Arundati, who were supposed not to have been able to make it, turned up quietly. It was great fun, and there was so much happiness! 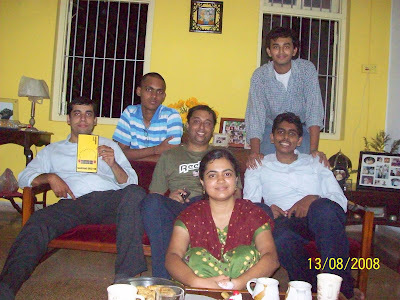 The previous two birthdays, as Sriram reminded me, had been spent at Sankar’s place. And always there was a cake, if not ale. This year the birthday was low key, as we had not planned anything, bar ordering food. Or so I thought. At about 7 pm, the group of youngsters with whom I share the interest of quizzing (mostly online) trooped in. I was pleasantly surprised, for I was not expecting them. 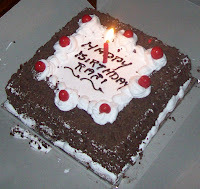 There was more - they had brought a delectable looking cake with my name on it and a single candle. They lit the candle and made me blow it, and even sang Happy birthday. I was overwhelmed. They stayed on to have tea and snacks, and brightened up the day considerably. Before leaving, they gave me some gifts as well. My regret was that I did not have anything to offer them but the snacks and tea. One of the gifts was a copy of the Indian edition of Rolling Stone, because it had my niece Parvati and her band, Emperor Minge, featured in it – and just because they had heard me mention it! 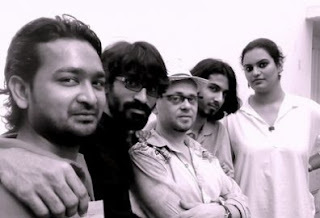 Thank you, dear young friends – Ananth, Hantan, Karthik, Subasri, Achu and Samba, (standing). You gave me a memorable day. Reunion, that was the flavour of the last one month. It all started when an ex-colleague came home with his mother to invite us to his wedding. We were very happy, and messages and phone calls started flying between other colleagues, most of whom have left the jobs too, and me to plan and go to the wedding reception at Injambakkam, outside the city. It was wonderful to meet one another at the reception, with a buffet on the lawns. (I loved the sensation of the crunchy, crisp grass under my feet.) It was almost like old times, when we used to have annual get-togethers and let our hair down. We then always had a lot to talk about, but now, I found that we were really a motley disjointed group, without the common bond of work to hold us together. But it was great to catch up with one another and make promises to meet again soon – which we will when another young ex-colleague gets married this month. We took a keepsake picture, all of us with JP and his bride, and our editor Vincent, with photographer Saravanan also rushing up to join the group and pose on his knee. 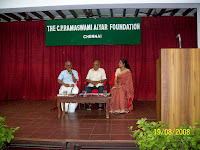 The next one was with my Trivandrum friends of my Pre-University days, with whom I have managed to keep in touch. Lakshmi, who lives there, and I have been in constant touch, and do get to meet often, mostly when she visits Chennai. 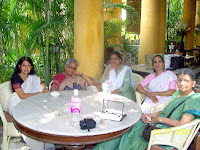 This time her daughter-in-law Gopika wanted to surprise her with a get-together of her friends for lunch. She arranged the rendezvous at a very nice place in Gopalapuram, called Amethyst. Apart from me, whom Lakshmi knew was coming, there were two other friends, Kanthi and Vijayam. It was rewarding to see the jaw-dropping amazement on Lakshmi’s face when they turned up. The ambience was lovely at Sundar Mahal, the old summer palace of the Raja of Jeyapore, with its colonial style architecture amid a lot of greenery. Tables were laid in the huge verandahs, shaded by various plants and creepers, and in the open air too. The place is an art gallery and boutique as well, and there are many tourists from abroad patronising it. The food is aimed to cater to their tastes, and, though we stumbled when it came to ordering, because Lakshmi avoids onions and garlic, the final order was satisfactory. 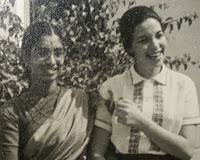 But food was only secondary that day to us, the years just fell off and to us it seemed that we were back in the grounds of Women’s College in Trivandrum, in the 1960s. Old stories were told and retold, memories rekindled, absent friends remembered and laughter prevailed. We chattered and giggled, and felt like the teenagers we used to be, not in the least like respectable women this side of sixty. We were on a high! The exercise was so successful that we decided to do it again, with more friends. Then last week came a card by courier post. And the handwriting on the cover thrilled me, it was from Judy. Here was the friend whom I had been trying to locate for the last six years – she had simply disappeared from the face of the earth, or so it seemed to me, after coming to Chennai from Hyderabad for my son’s wedding. We had studied together in Lady Shri Ram College, New Delhi, and been in touch over the years after we graduated in 1966. She had misplaced my address when she moved, and so we lost one another. My daughter-in-law’s mother who then lived in Hyderabad had done her utmost to trace her, but without success. Now fortunately Judy found my address (helps when you live at the same place for 40 years) and sent me the invitation to her son’s wedding this week. I called her and after exchanging the latest, promised not to lose one another again. 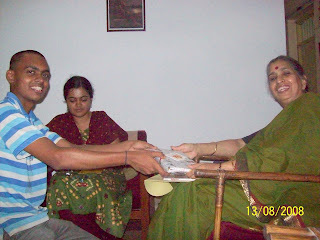 And a couple of days after that, a call from Nalini, the third member of our group, completed the circle. 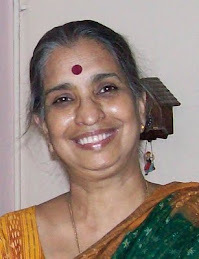 Nalini, living in the US for the last 40 years was visiting India, and calling me from Delhi. She is not coming to Chennai this time, she said, but is going to Hyderabad. Surely she will meet Judy – will I too? Watch this space. The three of us met last at my wedding! Now I am wondering if my horoscope last month might have read, among other things, “Meeting old friends is on the cards”. Old is the key word – one doesn’t get them that old nowadays, as Bob Hope said of his best friend Bing Crosby. August 1 was the day of the eclipse. 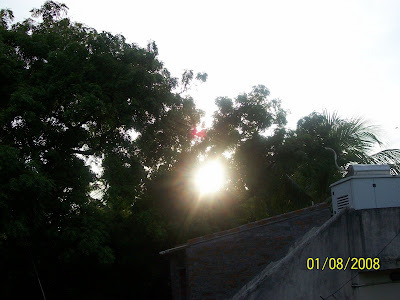 It was a partial eclipse here in Chennai, and was to be visible between 4.40 and 6 pm. 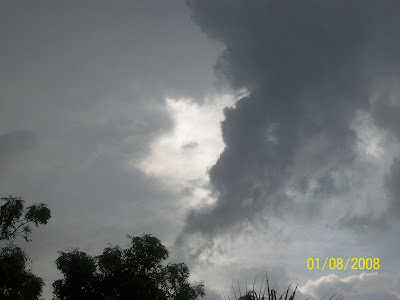 As the evening hour approached, the till then clear skies became cloudy and there were rumbles of thunder. 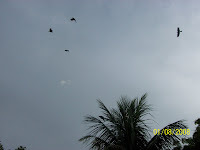 The crows and the parrots from the mango trees were agitated and flew about frantically, possibly confused at the earlier hour of darkness. 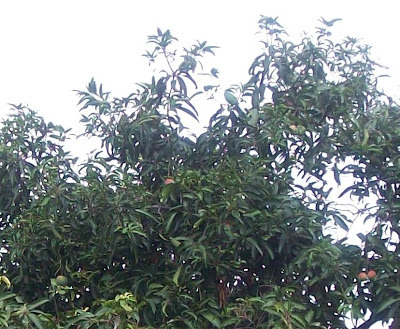 The parrots homed in to the mango trees, getting beautifully camouflaged in the greenery. What could have been a good view of the eclipse from our terrace was blocked by the clouds. I was disappointed. And after all that sound and fury, signifying nothing, it did not rain at all! 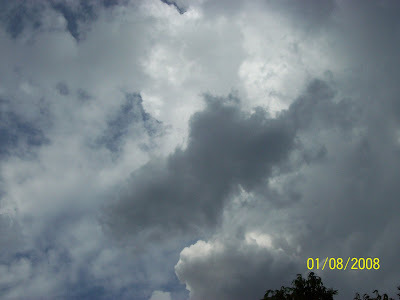 By the time the clouds had cleared, it was close to the end of the eclipse, and the sun was lower down in the skies. We could only catch a glimpse from between the top of the trees!